Heat a non-stick skillet and place two (oil-free) corn tortillas in it. Let them brown on both sides and then pop them in the toaster for a few seconds just to crisp them up. Keep an eye on them though, or they will burn. Slice red bell peppers, garlic cloves and green onions. Place them in a non-stick pan and add a bit of water and salt. Cover and let steam to soften a bit. Add several shakes of balsamic vinegar and let cook, uncovered, until most of the liquid is gone and the vegetables reach desired tenderness. Stir often. 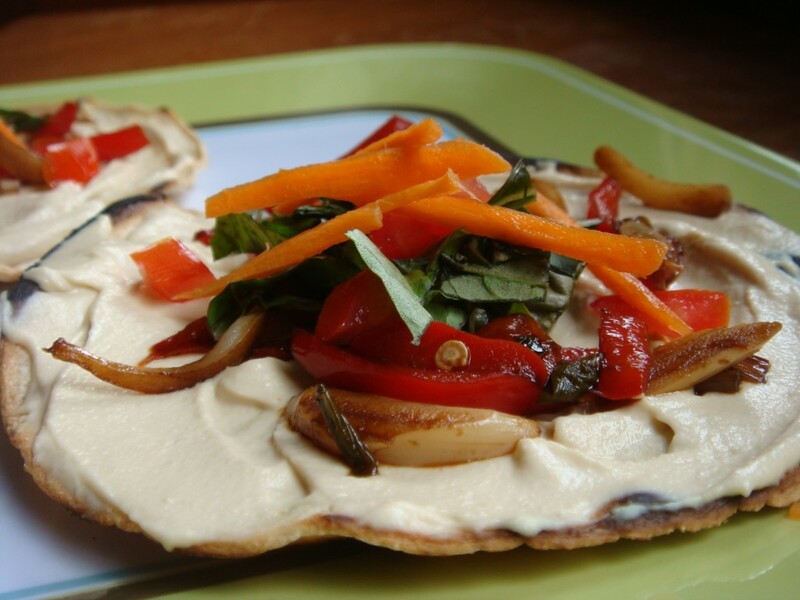 Smear oil-free hummus onto toasted corn tortillas. We had some left-over hummus in the fridge from a local restaurant, but if you don’t have any, here is a reference point for making your own. A food processor is best for making hummus, but a high quality blender can accomplish it for you too. I recommend keeping it fairly straightforward and simple for this tostada dish, as the toppings add a nice punch of flavor, themselves. Place sautéed veggies onto tostada and garnish with freshly chopped basil leaves, diced tomatoes and julienned carrots.